Taylor Canfield successfully defended his Congressional Cup title, but not without a challenge every step of the way. 12 skippers from nine nations competed in the 51st edition of the prestigious Congressional Cup regatta, hosted by the Long Beach Yacht Club 13 to 17 May. Canfield had moved his way up through the round robins with a solid – but not undefeated – record; and into the quarterfinals and semifinals, to race against Sweden’s Bjorn Hansen. Ian Williams and Phil Robertson made up the second pairing. The term ‘underdog’ is relative: and it might be hard to call Hansen, ranked no. five in the world, and Robertson, ranked 13, underdogs – but when racing against number one and two – Williams and Canfield – it’s justified. 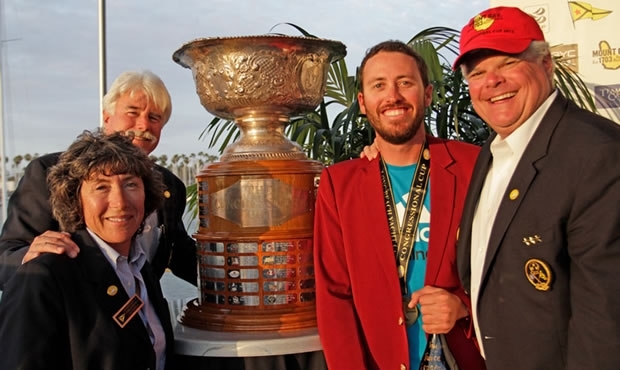 Particularly with Hansen a newcomer to the Congressional Cup boats and venue; and Robertson admitting his prior performance in Congressional Cup was "terrible!" So when Hansen defeated Canfield in this morning’s first match of the semis, and Robertson beat Williams, spectators and competitors alike knew it would be an exciting day. Canfield would go on to defeat Hansen in the next two races and advance to the finals, despite sterling opposition. To Hansen’s credit, his team had advanced swiftly and confidently, with incredible boat handling and speed, for Congressional Cup virgins. In the Williams/Robertson pair up, it was equally tight. Robertson took two wins, before Williams rebounded with two of his own. It came down to a final match; a thrilling tryst that went to Robertson in the end. During the subsequent boat swap, LBYC held a fleet race for the remainder of the racers. Keith Swinton’s Black Swan Racing Team won, trailed closely by Chris Steele, who’s crew hiked and sailed as if their Catalina was a 37-foot dinghy. Then it was ‘on’ for the first-to-two finals. Canfield triumphed in the first race, Robertson the second, and it came down to one sudden-death match. The wind had increased to 12 knots, from 220°. Both boats were OCS in the aggressive start; Canfield ducked to clear his bow but Robertson had to circle ‘round the committee boat, putting him at a disadvantage he would never completely recover from. ‘But not without trying. Canfield led by nary a boat length at the crossings; by the second top mark it was mere meters: so tight, the jibes were perfectly synchronised. The last match, Canfield admitted, was “intense.” “I was a little nervous coming into the event: I haven’t match raced since February, and probably sailed the worst I’ve sailed in a while. The team really pushed hard through the whole event.” In the final downwind leg, he said, “It came down to that last luff, and my guys were ready for it. We went right through the lee of Robertson; and kept working every moment.” Canfield crossed the finish line less than two seconds ahead of Robertson, to win the final match and the Congressional Cup title. “I put together a group of guys that are really good friends, so that’s the reason I came, to have some fun with my mates, at one of the best events in the world. So we are really, really happy. We did a fantastic job, and had a great time. The boys said we probably did everything 100%, both on the water and off. You couldn’t ask for more that that.” For all his zany antics, Robertson proved himself a sharp competitor, and beloved by his fans at LBYC. Williams took third place – an incredible comeback after falling behind in the round robins; he and his Team GAC Pindar fought to survive, and dashed Hansen 2-1. Hansen, in his inaugural Congressional Cup regatta, finished an impressive fourth. As the winning skipper, Canfield was awarded the coveted Crimson Blazer – an honour bestowed to the top names in sailing over the years, including Dennis Conner, Ted Turner, Dean Barker, Ken Read, Gavin Brady, and more. The event also disbursed a prize purse of USD$75,000. Race Your Boat Right was written by world champion yachtsman Arthur Knapp Jr. in 1960. It has been, for decades, the Congressional Cup consolation prize – presented with all decorum, on a pedestal, encased in glass. This year it went to Congressional Cup Chairman Bill Durant’s own son, 12th-place competitor Dustin Durant. But before anyone would be too hasty to judge, the Chairman chided, he read off some of the recipient names inscribed on the base: “Gary Jobson, Ted Turner, Dave Ullman … “ And as he read, a hand crept up from the far side of the dais. Taylor Canfield. Recipient of The Book in 2011 … and in 2015, his second Crimson Blazer.